The parish is rural and although many villagers commute to work there are still those employed in agriculture. Sheep, beef cattle and arable are all important in the parish. The most northerly of the parishes, it includes the highest point in Northamptonshire (Honey Hill) and J1 of the A14. The pub survives, while the shop, post Office, bakery and school have all closed. The recently refurbished village hall hosts a monthly luncheon club for senior citizens and a Friendly Club and is available for hire for meetings and parties. The large playing field has cricket and football pitches, all-weather tennis courts, a children’s play area and a large pavilion. The bowling green has its own pavilion. On the edge of the parish lies the 27-hole Cold Ashby Golf Club. Cold Ashby was the local pioneer of the Open Gardens Weekend and draws good crowds each summer, many from some distance. The Open Gardens Weekend involves many local villagers and creates a great community spirit. Our mostly middle-aged congregation varies between 5 and 15 on a normal Sunday. We have a loft organ which is used occasionally, supplemented by an excellent music system which allows us to sing hymns at all services. The Yelvertoft Choir has joined us for our carol services, where we have a full-church congregation. Our services are Communion on the first Sunday and Worship for All on the third Sunday in the month. There are special services at the main festivals. The churchwarden is Deborah Sampson however the seven PCC members with the help of the village share all the tasks and keep the church in excellent condition. The PCC would welcome new members and new worshippers to help our congregation to grow, which is vital for our future. The church is open every day in order that villagers or visitors can come in to see this lovely church, to use the book swap or study our display of village photos. Breakfast is served in the church three times a year, to which all are welcome. This is a stone church that seats about 100. 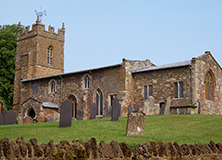 It has a square west tower with corner pinnacles, and is reckoned to date from the 12th to 14th century. The porch is 17th century and the vestry, north door and organ gallery are 19th century. Two of the stained glass windows depict the church as it was in the 19th century. There was major restoration to the roof in 1991. One of the bells, dated 1317, is reputed to be the world’s oldest bell hung for change ringing. The lych gate was added in 1883 and is separately listed grade II. The churchyard was closed by order in council in 1884, and is raised with retaining walls. There is a relatively modern multi-coloured east window which looks glorious on a sunny day. Please call in to have a look.